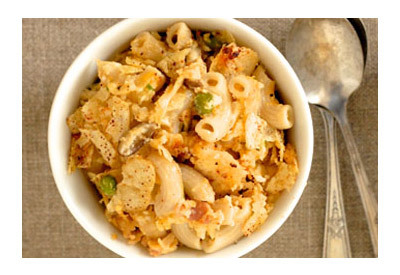 In this recipe, gluten free mac and cheese gets an added crunch with LAY'S Classic Potato Chips. In a large skillet over medium-high heat, cook bacon until it begins to brown, but not crisp. Add shallot and garlic and cook 2 minutes. Add mushrooms and peas. Cook until mushrooms become tender. Remove from heat and set aside. Combine Cheddar cheese, Swiss cheese, and 1/2 cup Parmesan cheese in a large bowl. Stir in warm pasta and bacon mixture. In a medium bowl or measuring cup, combine milk, egg, parsley, salt and pepper. Pour milk mixture over pasta mixture and stir until well-combined. Pour pasta mixture into a 13x9 inch baking dish coated with cooking spray. Combine potato chips and remaining 1/2 cup Parmesan cheese in a medium bowl. Sprinkle mixture over pasta.